Pining For Spring Nails, Sparkle Like You Mean It! 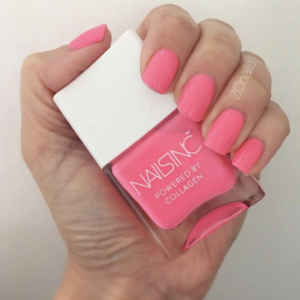 I am absolutely pining for Spring and what’s more I’m really exciting to see what goodies Nails Inc will have in store this coming season. In the meantime, with hopes of sun rays and warmer days I will be sparkling like I mean it! 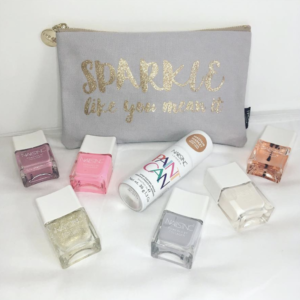 This lovely collection from last Spring is still available to purchase online HERE at Nails Inc.
A steal for just £25 a cosmetic bag rammed full of Spring shades, glittery gold, top and base coats plus the Worlds first spray on nail polish! 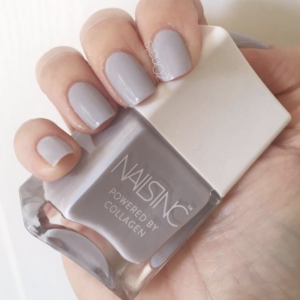 I really like the angular shaped brush that Nails Inc polishes come with, it make application a breeze, plus it’s a great alternative for a break between gel mani’s, which reminds me I must try the Nails Inc Gel Effect polish and report back ASAP! Pictured below are the shades, Pembroke Street Collagen polish (14ml) – neon pastel pink and Edward Place Collagen polish (14ml) – a soft lilac grey, just lush! SHOP THIS LOOK – Scandal, as seen on IG! SHOP THIS LOOK – Perfect Pony in Ginger Brown, as seen on IG!